Aluminum railing is available in a range of anodized and powder coated finishes to match the color theme of your design. The strength, light weight, and weather resistance of aluminum make it an excellent choice for both indoor and outdoor applications. The aluminum railing system is perfect for stadiums, malls, airports, parking garages and many other commercial projects. One reason that aluminum railing is so popular is their durability. If handled appropriately, these railings will never have to be replaced, making them an extremely cost effective system. Also, with the cost of steel rising upward, aluminum railing is very comparable, price wise. Simply put, a better product with little or no maintenance for about the same price. 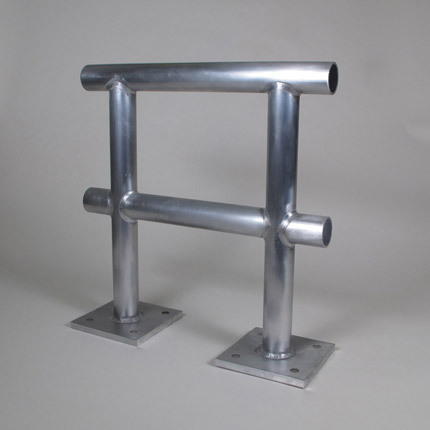 Also, aluminum handrails are light weight, making installation easier and faster. Faster installation makes a huge difference and it saves you money.